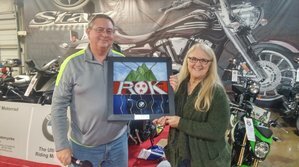 Each year the club selects a winner of the Ed Nabors Ultimate Motorcylist of the year award at the January meeting. The award is given based on a wide variety of criteria based on each members participation and contribution to the club. You earn points for leading rides, attending meetings, rallies, and events. This year's winner is our club president Bill Van Voorst. Bill displayed outstanding committment to the club's success by participating in almost all events as well as leading very enjoyable and well attended group rides. Bill was unfortuantely ill the night of our meeting so Nancy brought home the reward and our club's congratulations!